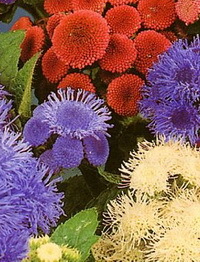 Ageratum houstonianum is a popular annual garden plant. Also known as Floss Flower it is often used for edging borders and is also useful in beds and containers. A neat bushy plant with clusters of fluffy flowers in shades of white, pink and blue from June until the first frosts. Ageratum will grow in any reasonable garden soil but cannot withstand heavy shade or a wet site. Eggplant is a frost tender, heat loving, branching bushy plant with thick, woody stems. The green to grayish green leaves are large,lobed, and alternate with the underside typically covered with spiny fuzz. Mature plants range from 1 to 8 feet in height. Although eggplant is a perennial, it is more commonly grown as an annual. The fruit has a dense, uniform and firm, white, sweet flesh. Spanish Daisy is an easy to grow annual plant for hanging baskets, flower beds and rock gardens. Originally from Central America, it has been growing wild in Southern Europe for many years and is now being hailed as one of the greatest horticultural discoveries of recent years. The masses of small flowers are pink when they open, rapidly turn white, and finally as they mature change back to rose-red giving the plant an unusual and constant two-tone effect. A climbing or pole bean, French Bean Jimenez has been bred to grow in the form of vines which cling to poles or trellises. Their growth habit makes them very easy to harvest. These beans are also very easy to grow so long as you give them a nice warm site and a little shelter. An heirloom variety of French bean Jimenez is a strong grower and produces heavy crops of large long flat pods. The vines or plants can reach 7-8 feet tall but a 5 foot tepee, trellis or poles are usually sufficient. The flat pods are green streaked with red, have a great flavour and are stringless until they start to ripen. As they mature the pods get redder. The seeds or beans inside are of course coloured. Pods can be sliced when green and used as fresh beans or left to mature, then shelled and dried. 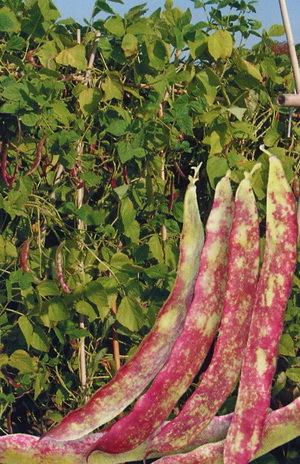 Highly colourful, French Bean Jimenez has a strong resistance to Bean Common Mosaic Virus. Perfect for a sunny, well-drained spot, French bean Jimenez prefers to grow in moist, fertile soil away from strong winds, but it can also be grown successfully in pots. Garlic Chives, sometimes called Chinese Chives, are perennial herbs. They look like grass, similar to chives but have a gentle spicy aroma and a distinct but much milder flavour of garlic. A member of the onion family they are very easy to grow. Garlic chives will thrive and grow vigorously on any fertile, moist but well drained site in full sun. A relatively new vegetable in the western world, garlic chives are well known in Asian cuisine. 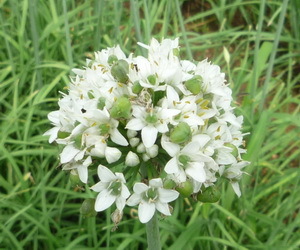 Grows slowly in expanding clumps and, besides its use as a vegetable, the plant's attractive flowers ensure that it is sometimes grown in perennial borders. Both the leaves and the stalks of the flowers are used as flavouring as well as a stir fry ingredient. The flowers can also be used as a spice. Garlic chives are extremely hardy and can survive very low temperatures (some have been know to survive -35 C) in winter and sprout again in spring when the temperature rises. To speed seed germination it is generally recommended that seeds be soaked in warm water (below 40 C) for about 24 hours prior to sowing. Uses include mixed in omelettes or scrambled eggs, all sorts of salads or chopped very finely and sprinkled over cooked new potatoes. The naming of plants is a complex issue. Many books are written about it, taxonomists continually revise names as more information come to light, breeders continually develop new varieties, and marketing organisations need names that appeal to consumers. All living things are placed in a hierarchical classification which tries to group them together by how closely related they are to each other. For our purposes, we need consider only groupings at the family level down. Family: groups together related genera (singular genus). Thus the family Scrophulareaceae contains the genera Antirrhinum, Linaria, Mimulus, amongst others. Genus: groups together related species. The genus Antirrhinum contains the species Antirrhinum majus, Antirhinum glutinosum, many others. Species: a species is normally defined as a group of plants that will breed with each other but which normally will not cross breed with other groups. There are exceptions to this, with many (particularly vegetatively propagated) varieties being the result of cross breeding that would not take place in nature without some assistance. Variety: a group of plants with closely defined properties, distinct from other varieties, uniform in their appearance and stable across generations of propagation. In the case particularly of bedding plants, varieties may also be grouped together in series so that different colours can be grown together with the plants otherwise having similar growth habit and performance. For our purposes, we will not go beyond these levels in our catalogue, although we do try and group together plants that can be used in combination in various ways, and by how they might be used. For those interested in understanding the full complexity of horticultural nomenclature, follow this link - http://www.hortax.org.uk/ .